As a pet owner, it can be heartbreaking when your cat gets sick. After all, he’s your furry little friend and you hate to see him suffer. Sometimes, however, it’s more than just heartbreaking – it can be a little gross too. This is the case when a cat gets worms. No one likes to hear the word “worms” when it comes to their pet, but the truth is that intestinal parasites are fairly common in cats – especially for outdoor cats. There are several different kinds of intestinal parasites to worry about and there are a number of paces your cat can get them. So, what do you do if your cat becomes infected with worms? The first step is always to consult your veterinarian but the second step is to buy a cat dewormer to take care of the problem. Fortunately, there are many cat dewormers available over the counter – keep reading to see our top 10 picks. If you aren’t ready to spend a lot on a deworming treatment but you want to resolve your cat’s condition, these PetArmor Worm Away Caps might be a good option. More affordable than other OTC dewormers, this treatment still contains the active ingredient piperazine. Piperazine works by paralyzing the worms so they can be passed in your cat’s stool. These tablets are safe for cats and kittens over 6 weeks of age and they are designed to treat roundworms. These PetArmor Worm Away Caps can be administered whole or you can crush them and place them in your cat’s food. Depending on your cat’s size, you may need to administer more than one pill. Just be careful with the dosage because giving your cat too much could cause side effects like drooling, nausea, vomiting, and muscle tremors. Roundworms are the most common parasite seen in cats and this Durvet WormEze Feline Liquid is a powerful treatment to kill them. This liquid medication contains the active ingredient piperazine which paralyzes roundworms, allowing your cat to safely pass them in his stool. In order for the treatment to be effective, you’ll need to repeat it in 10 days. The liquid itself is easy to measure and administer, but you still need to be careful if you want to avoid overdose. This Durvet WormEze Feline Liquid can be taken directly by mouth or you can mix it into your cat’s food. It is safe for kittens and cats over 6 weeks of age and it is very affordable to purchase over-the-counter. Though symptoms are rare and mild, taking too much of the treatment could cause nausea, vomiting, or muscle tremors so keep an eye on your cat after treatment. If you’re looking for a product that treats both roundworms and tapeworms, this is it. This Pyrintal Roundworm and Tapeworm Dewormer contains two active ingredients – praziquantel and pyrantel embonate – which kill both tapeworms and roundworms. It comes in an easy to administer tablet that you can feed whole or crush and mix it into your cat’s food. Dosage is made by weight, so pay close attention to reduce the risk of overdose which could cause negative side effects. This Pyrintal Roundworm and Tapeworm Dewormer works very quickly to get parasite infestations under control and side effects are rare and mild. Though Bayer Tapeworm Dewormer is the top product on the market specifically designed for tapeworms in cats, these Pro Labs, Ltd. Feline Tapeworm Tabs are a close second. These tablets contain 23mg of the active ingredient Praziquantel which is the same as the Bayer formulation. This dewormer has been proven effective against multiple strains of tapeworm, so it may be the better option depending on your vet’s diagnosis. These Pro Labs, Ltd. Feline Tapeworm Tabs are easy to administer – you can give them to your cat whole or crush them and put them in his food. They are approved by the FDA for over-the-counter purchase and the risk for side effects is low. While many over-the-counter dewormers use chemical ingredients to destroy worm infestations, HomeoPet Feline Worm Clear works a little differently. This dewormer is designed to make your cat’s digestive tract as unappealing to parasites as possible, forcing them to give up hold and be eliminated from your cat’s body through his stool. It works for all kinds of worms including tapeworms, hookworms, roundworms, and whipworms. This HomeoPet Feline Worm Clear treatment is made from safe and natural ingredients and the company that produces it is FDA-registered. Unlike many dewormers, this is not a tablet or liquid that you administer orally. You actually spray the liquid onto a cloth and wipe it onto your cat’s fur – in cleaning himself, he’ll ingest the liquid. Once you administer the treatment, its effects can work for as long 2 months. Many cat owners don’t like the idea of giving their pet medications. If your cat has worms, however, you definitely need to treat him. This Naturpet D Wormer is a great alternative to over-the-counter dewormer medications. It is made with natural ingredients like black walnut, wormwood, black seed, fennel seed, sage leaf, and papaya leaf. It comes in an easy to administer liquid form with an eye dropper so you can measure a precise dose. This Naturpet D Wormer is effective against both roundworms and tapeworms, so it works well if you aren’t sure which type of worm your cat has. This treatment features a combination of herbal ingredients that have been shown to offer antifungal and antiparasitic properties in addition to supporting healing in the digestive tract. If your cat doesn’t do well with tablets, this Excel Roundworm Liquid Dewormer is a great option. Shown to be highly effective against roundworm infestations, this treatment has a delicious vanilla flavor appealing to both cats and kittens. This treatment contains 250mg piperazine in each 5ml dose which paralyzes roundworms so your cat can safely pass them out of his body through his stool. This Excel Roundworm Liquid Dewormer is safe for cats and kittens over 6 weeks of age and it is very easy to administer. Simply feed the liquid directly or add it to your cat’s food. To ensure that the infestation is taken care of, you may want to administer a second dose after 30 days to prevent reinfestation. Just be careful with the dosage because giving your cat too much could cause side effects like nausea or vomiting. Made with the active ingredient praziquantel, Bayer Tapeworm Cat Dewormer is one of the top dewormers on the market for cats. This dewormer contains 23mg of the active ingredient and it is shown to quickly and effectively kill tapeworms. It comes in the form of a tablet which can be administered whole or crushed and mixed into your cat’s food. The treatment is very safe, and any side effects are rare and minimal so if you later find out your cat has a different kind of worm, he won’t be harmed by taking this treatment. Some cats simply don’t do well with tablets in which case a liquid treatment might be a better option. One of the best liquid dewormers for cats is Pro-Sense Liquid Cat Dewormer. This liquid dewormer has an appealing flavor and it is easy to administer. For each teaspoon of liquid, your cat will receive 250mg piperazine which is highly effective in paralyzing roundworms so they can be safely passed through your cat’s stool. Though this formula is easy to administer, it is important that you get the proper dosage. If you give your cat too much Pro-Sense Liquid Cat Dewormer he may experience side effects such as nausea, vomiting, and muscle tremors. At the first sign of an overdose, you should contact your veterinarian or take your cat to an emergency clinic. If you aren’t sure what kind of worm your cat has, or if he has a complex infestation of multiple worms, a broad-spectrum dewormer may be the way to go. Bayer Drontal Broad Spectrum Dewormer is one of the top dewormers on the market and it is effective against tapeworms, hookworms, and roundworms. This treatment features the active ingredients pyrantel pamoate and praziquantel, so you can rest assured that it will work quickly and effectively to eliminate your cat’s infestation. Bayer Drontal Broad Spectrum Dewormer comes in tablet form, each containing 18.2mg praziquantel and 72.6mg pyrantel base – the tablets can be taken whole or crushed and mixed into food – you can also cut them in half or quarters for smaller doses. Though side effects are always a possibility with medications, the side effects for this treatment are rare and minimal. Though you’ve probably heard of intestinal parasites, you may not know that they are a common problem for cats – especially for outdoor cats. As a pet owner, it is your responsibility to keep your cat safe from things that could harm him and to get him the treatment he needs when he is sick. You can’t always prevent your cat from getting sick, but you can give him the best treatment possible as quickly as possible. Worms are a common problem in cats and, though they are generally pretty easy to treat, they can lead to serious problems if you don’t act quickly. Symptoms can progress if the infestation gets worse, particularly for young cats and kittens. In many cases, an over-the-counter dewormer will be sufficient to deal with an intestinal parasite infection. You still need your vet’s help to identify which type of worm your cat is carrying and which kind of treatment is best, but there are plenty of options to choose from. Keep reading to learn more about the different types of worms in cats, where your cat might get them, and how to treat the problem. What Are the Most Common Types of Worms in Cats? Intestinal parasites are often referred to as “worms,” and there are several different types your cat is likely to encounter. Sometimes cats don’t show any outward signs of a parasite infection which means that the infestation can get worse over time. These symptoms may differ depending on the type of worm your cat is infected with and the severity of the infection. If you notice any of these symptoms, you should talk to your vet. Roundworms – These are the most common intestinal parasites seen in cats and they look almost like long, thin spaghetti noodles. Roundworms are usually 3 to 4 inches long and they can be acquired by ingesting an infected rodent or the feces of an infected animal – kittens can also get them from an infected mother’s milk. Hookworms – Much smaller than roundworms, hookworms are less than an inch long and they feed on the cat’s blood. Hookworms live in the small intestine and they can cause anemia, particularly in kittens. Eggs are typically passed in the stool which hatch into larvae and can infect other animals if they are ingested. Tapeworms – These long, flat worms are a type of segmented parasite and they can grow up to 28 inches long. Tapeworms can cause weight loss and vomiting as symptoms, and cats usually get them by ingesting an infected host like a rodent or flea. When a cat is infested with tapeworms, you’ll usually see segments that look like grains of rice passed in the stool. Lungworms – Though they are not an intestinal infection, lungworms are still a parasite that can infect your cat. Most cats don’t show symptoms when infected with lungworms, though some develop a cough. Cats get lungworms from eating infected insects, birds, or rodents. Now that you have a better understanding of the different worms your cat could get, you may be wondering where he might get them. Keep reading to find out. All cats have the potential to develop a parasitic infection if exposed to worms. There are, however, certain factors which may increase your cat’s risk. Outdoor cats have the highest risk for developing internal parasite infections because they hunt and eat rodents that are likely to be exposed to contaminated soil. 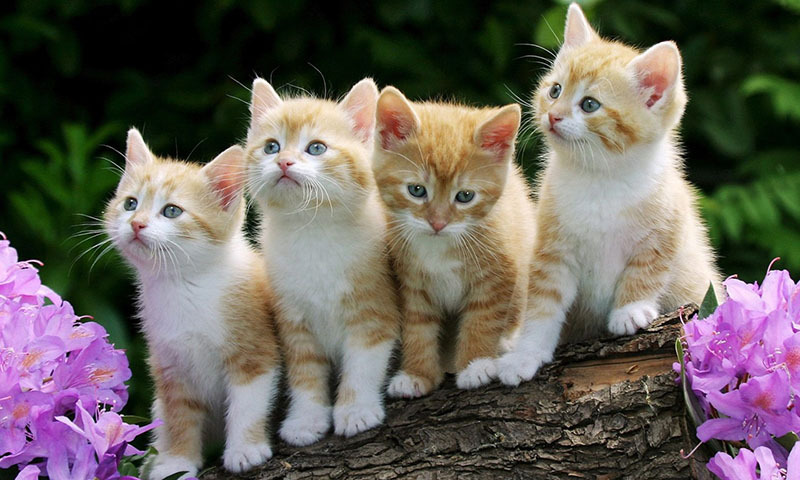 Cats that go outdoors are also more likely to catch fleas which can carry tapeworms. Additionally, any cat that hasn’t had its vaccinations is at a higher risk for getting sick in general and that includes worms. Not only can your cat catch worms from another cat or another animal, but you can catch them from your cat! Be very careful when handling infected stool because accidental ingestion can lead to a serious infection that causes nasty symptoms. How Do You Get Rid of Worms in Cats? If you think that your cat has developed intestinal parasites, you should take him to the veterinarian immediately. Even if he isn’t showing any severe symptoms, you’ll need your vet’s help to identify the type of worms, so you can purchase the right dewormer. Once you have a diagnosis, you can talk about your options for treatment. The most effective treatment for worms in cats is a dewormer. Remember, however, that different worms require different treatment so you need your vet’s help to choose the right kind of dewormer. When you choose a dewormer, follow the dosing instructions carefully. Once you’ve treated your cat for worms, you want to make sure he doesn’t get them again. Keep your cat indoors and limit exposure to rodents and fleas. Take steps to make sure your home and your property are free from fleas. Wear gloves when changing your cat’s litter and when disposing of animal waste. Check your cat’s stool once in a while for signs of worms or other problems. Talk to your veterinarian about other preventive measures. If your cat loves to spend time outdoors, he will always be at-risk for developing worms. You should seriously consider keeping him inside and finding other ways to keep him busy. Try installing a window ledge so your cat can see the outside and keep him active with interactive toys. Even if it isn’t quite the same, it’s always better to be safe than sorry. If your veterinarian confirms that your cat has intestinal parasites, a cat dewormer should be on your shopping list. Any of the ten cat dewormers reviewed above would be a good option, so take the advice you’ve received here and get your cat the treatment he needs!